This post is inspired by the recent BBC News article, “Amanda Knox and Bad Maths in Courts.” The article highlights the importance of good mathematical understanding when handling probabilities – and how mistakes by judges and juries can sometimes lead to miscarriages of justice. A murder scene is found with two types of blood – that of the victim and that of the murderer. As luck would have it, the unidentified blood has an incredibly rare blood disorder, only found in 1 in every million men. The capital and surrounding areas have a population of 20 million – and the police are sure the murderer is from the capital. The police have already started cataloging all citizens’ blood types for their new super crime-database. They already have nearly 1 million male samples in there – and bingo – one man, Mr XY, is a match. He is promptly marched off to trial, there is no other evidence, but the jury are told that the odds are 1 in a million that he is innocent. He is duly convicted. The question is, how likely is it that he did not commit this crime? We can be around 90% confident that he did not commit this crime. Assuming that there are approximately 10 million men in the capital, then were everyone cataloged on the database we would have on average 10 positive matches. Given that there is no other evidence, it is therefore likely that he is only a 1 in 10 chance of being guilty. Even though P(Fail Test/Innocent) = 1/1,000,000, P(Innocent/Fail test) = 9/10. This logic however, whilst intuitive is not mathematically correct. As explained by mathematician Coralie Colmez in the BBC News article, by repeating relatively unreliable tests we can make them more reliable – the larger the pooled sample size, the more confident we can be in the result. One of the most (in)famous examples of bad maths in the court room is that of Sally Clark – who was convicted of the murder of her two sons in 1999. It has been described as, “one of the great miscarriages of justice in modern British legal history.” Both of Sally Clark’s children died from cot-death whilst still babies. Soon afterwards she was arrested for murder. The case was based on a seemingly incontrovertible statistic – that the chance of 2 children from the same family dying from cot-death was 1 in 73 million. 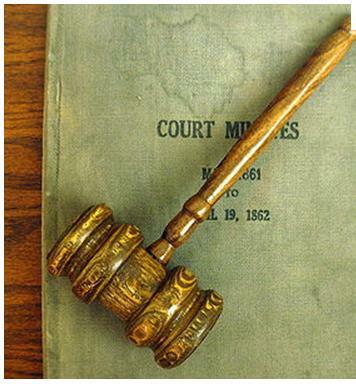 Experts testified to this, the jury were suitably convinced and she was convicted. The crux of the prosecutor’s case was that it was so statistically unlikely that this had happened by chance, that she must have killed her children. However, this was bad maths – which led to an innocent woman being jailed for four years before her eventual acquittal. The 1 in 73 million figure was arrived at by simply looking at the probability of a single cot-death (1 in 8500 ) and then squaring it – because it had happened twice. However, this method only works if both events are independent – and in this case they clearly weren’t. Any biological or social factors which contribute to the death of a child due to cot-death will also mean that another sibling is also at elevated risk. Additionally this figure was presented in a way which is known as the “prosecutor’s fallacy” – the 1 in 73 million figure (even if correct) didn’t represent the probability of Sally Clark’s innocence, because it should have been compared against the probability of guilt for a double homicide. In other words, the probability of a false positive is not the same as the probability of innocence. In mathematical language, P(Fail Test/Innocent) is not equal to P(Innocent/Fail test). 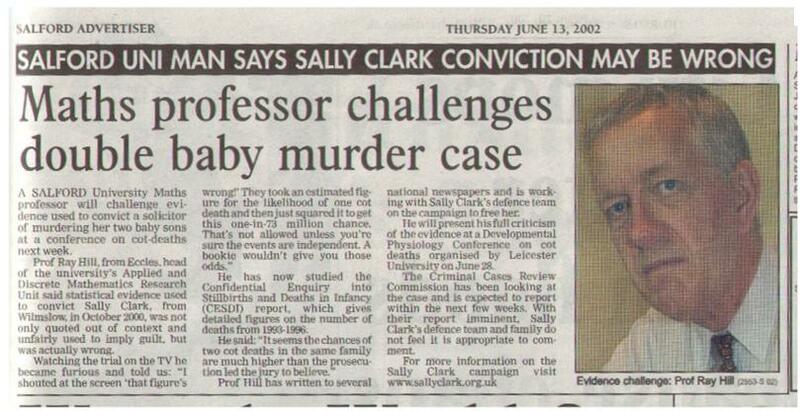 Subsequent analysis of the Sally Clark case by a mathematics professor concluded that rather than having a 1 in 73 million chance of being innocent, actually it was about 4-10 times more likely this was due to natural causes rather than murder. Quite a big turnaround – and evidence of why understanding statistics is so important in the courts. This topic has also been highlighted recently by the excellent ToK website, Lancaster School ToK.